1512 Asserted to have been discovered by Portuguese Capt. in honor of his patron Dom Garcia de Noronha. the Heure-du-Berge, lands on Diego Garcia. Garcia, formally claiming it 4 May 1786 for U.K.
1788 Formally annexed by France part of Mascarene Islands. 17 May 1810 Occupied by British as part of the Seychelles. (of 30 May 1814), part of Seychelles (Oil Islands). 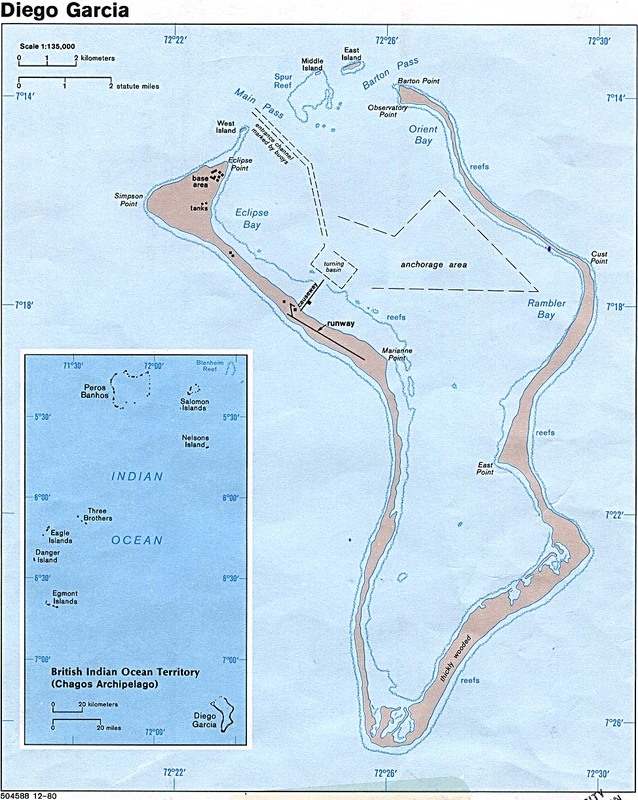 Feb 1942 - 30 Apr 1946 British RAF Station Diego Garcia and naval garrison. Islands, Farquhar and the Des Roches Islands). 3 Apr 1967 U.K. buys all plantations on the islands. 1 Oct 1977 U.S. Naval Support Facility Diego Garcia opened. government decision denying the islanders return. 20 Dec 2012. Finally, on 29 Jun 2016 the U.K.
the waters around the Chagos Archipelago. 25 Jul 1976 - 23 Jul 1977 Arthur G. Portwine, Jr.
1 Jul 2004 - 21 Jun 2005 Edward Martin, Jr.
Territorial Disputes: Mauritius and Seychelles claim the Chagos Islands; negotiations between 1971 and 1982 resulted in the establishment of a trust fund by the British Government as compensation for the displaced islanders, known as Chagossians, who were evicted between 1967-73; in 2001, the former inhabitants of the archipelago were granted U.K. citizenship and the right of return; in 2006 and 2007, British court rulings invalidated the immigration policies contained in the 2004 BIOT Constitution Order that had excluded the islanders from the archipelago; in 22 Oct 2008 a House of Lords' decision overturned lower court rulings, once again denying the right of return to Chagossians, in 29 Jun 2016 the U.K. Supreme Court affirms the 2008 House of Lords' decision denying the right of return to Chagossians; in addition, the U.K. created the world's largest marine protection area around the Chagos islands prohibiting the extraction of any natural resources therein.